Healthy Eating: Expensive Compared to What? For those looking to stretch their health food dollars as far as possible, you may find some inspiration in my article 10 Ways to Eat Primal on a Budget, but today I want to delve into the deeper issues at play here. Whether or not the cost of high quality food is worth it is hotly debated. Some passionately believe that organic produce and locally raised, grass-fed animals provide superior nutrition which, in turn, helps prevent illness. This group believes that the extra cost of quality food outweighs costs associated with being sick. Others argue that there isn’t enough scientific evidence to prove these claims so they can’t justify spending the extra money on food. With reasonable data to support both sides, it’s hard to say. 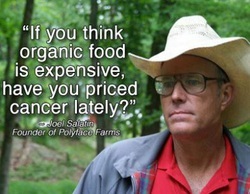 So I will spend the remainder of this post exploring my own belief that whole food is worth the extra price tag. Just like anything else, it comes down to choices. 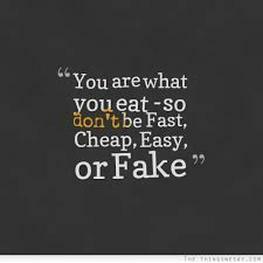 If you don’t believe you can afford to eat healthfully, consider the high price of being sick and lethargic. Calculate the tangible costs of medications, alternative therapies and unpaid sick days. Consider the intangible costs of the lack of energy to play with your children or make it through a busy work day. Many of these things are completely avoidable by feeding your body real food. It has been my experience, as well that of most of my clients, that once fat-adapted we are actually satisfied with less. When our food quality is high (grass fed burger — no bun — and steamed veggies drizzled with olive oil) vs. low (frozen pizza or fast food meal deal), it sustains us for much longer and even eliminates the desire to snack in between meals completely. So when we argue that a meal deal is cheaper, we have to also consider the added cost of the snacks we’ll eat later. On that note, in almost every other area of life (besides food quality), we’ve come to accept that we get what we pay for. We pay less for something, we lower our expectations. We’re not surprised when the toys from the Dollar Store break quickly. We tolerate the cheap cup of coffee at the local diner but would raise hell if our premium Starbucks cup was not up to snuff. Yet there seems to be this collective mentality that we should be able to spend as little as possible on our groceries without any significant repercussions to our health. When did we stop caring about quality food? Whether we’re aware of it or not, we all have a hierarchy of what’s most important to us. We call these our values. And the ways in which we make decisions, act, and spend money are usually quite consistent with what we value. For example, a person who loves adventure won’t begrudge spending money on a vacation. Similarly, athletes look at the costs associated with their sport (sticks, skis, skates) as an investment. Interestingly, when most people stop to consider where their health ranks in their hierarchy of values, it’s usually pretty high up there. After all, without reasonably decent health you can forget about travelling the world or skiing at Whistler. Furthermore, it can cause huge internal conflict to live a life that is inconsistent with your highest values. If you value your health, then prove it yourself by investing in what your body needs while it’s still your decision — before you’re backed into a corner by a devastating health diagnosis. If we’re looking for reasons to support a belief that we can’t afford good food, then we’ll be able to find plenty of evidence. But the opposite is also true. Clearly, there is no one size fits all solution. But I will leave you with one final “food for thought” — when it comes to your health, would you rather pay now or pay later?